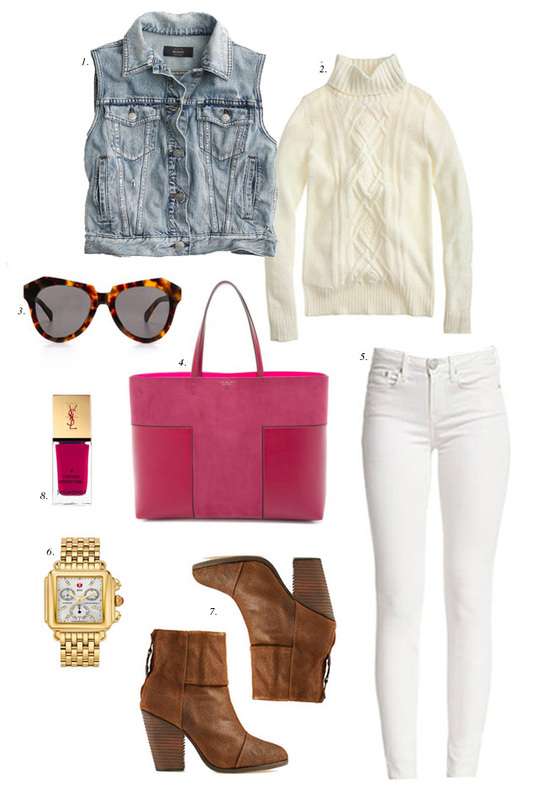 A little fall time outfit inspiration for your Wednesday morning! Nice selection! I really like the J.Crew sweater and denim vest. I like the idea of matching a turtleneck with a denim vest, thanks for the inspiration! Beautiful pink bag too! I love that pink bag! Love love the jean jacket & sweater! Great picks! Great collection. Love the bag ! Love the booties (what a nice color!) and sweater! Just got this sweater, and I’m already obsessed. I know you’ve purchased it season after season, and I can see why. I love a good winter white! Great accessories! Great outfit and tote! Lots of colours perfect for Fall! Love the color of that denim vest, and I’ve been eyeing the white jeans look for years but haven’t been able to find a pair that fits perfectly yet! Especially since the white is really unforgiving to less-than-perfect fit! Such a cute mix of things, it would make for a perfect outfit! I just ordered that sweater, and can’t wait for it to come in. I am loving all of the white denim for Fall this year! What’s New New: The best New Fashion up on the Blog today! I am obsessed with that TB bag, but in black. Great picks! That denim vest is so cute, and it would pair nicely with the J. Crew sweater! Great booties! Those would definitely be a fall / winter staple. Great booties! Those would definitely be a fall / winter wardrobe staple for me. I need those Rag & Bone booties in my life! Love this look and that pink bag is perfect! I love the wash of the denim vest! Love the denim vest, great style! Wow, I’m loving this look you put together, Rach! The pink looks great with the neutrals to add a nice pop of color. Thanks for the inspiration, as always, and I hope you’re having a fabulous day, beauty! that pink bag is beautiful!!! Yeesss! I am really looking for a good denim vest! I LOVE white pants for this fall!!! And that sweater is great too! I love all the pieced you pulled together for this look! I love that high neck jumper. Cute pieces.